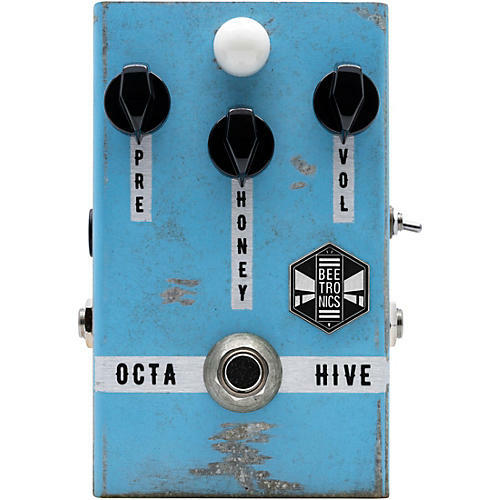 The Beetronix OctaHive is a super-high-gain fuzz with a well-pronounced high-pitch octave. The octave can be turned off by the toggle switch, turning it into a warmer and thicker fuzz pedal. The best way to achieve a well pronounced octave sound is by rolling off on the Pre gain and tone control on your instrument. The balance between Pre and Honey is the key to achieve a variety of sounds. On the octave mode, things can get really nasty, splashy and gated. It's great for high-gain leads, specially when played above the 12th fret. With a little less Honey you can get that "purple haze" tone. At low gain settings it can produce "ring modulator" overtones, great for textures. With the octave off, it's a whole different pedal, producing a warmer and thicker fuzz tone, making it more versatile and "chord friendly." The OctaHive is based on the 1970s Tycobrahe Octavia, and it can produce classic and modern sounds.